From the first glance of the gorgeous promotional art, to the in-game screenshots it's clear this title aims to bring back the magic of NES-era retrogames with a unique pixellated style. 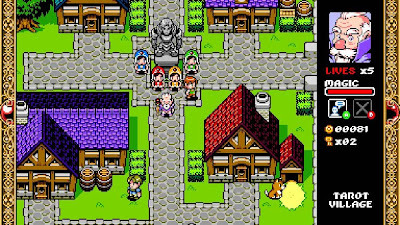 Although it's not blatantly stated on the official site as of now, the game also appearsto offer a number of RPG-style elements, including an arsenal of magic spells that can be cast, a town (with townsfolk! ), a navigatable overworld, shops in which items can be purchased, etc. 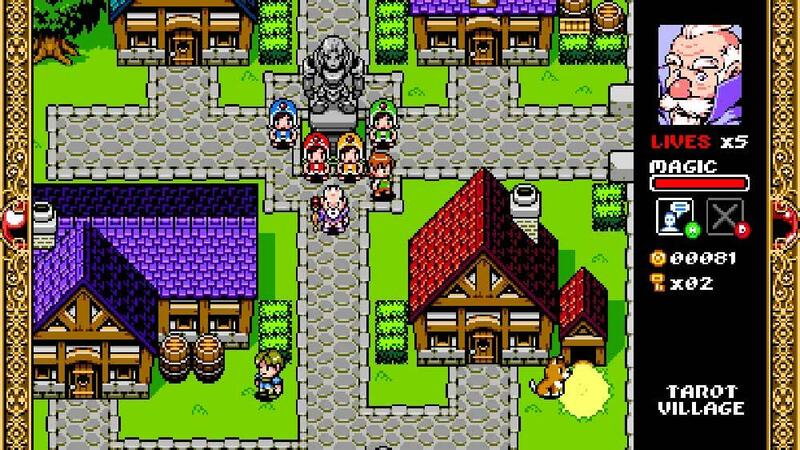 Let it be said clearly that I was definitely excited to play this game - wouldn't it be wonderful if a genre that I somewhat enjoy (brick breaker) could be fused with my favorite genre of game (RPG)? Once you trek off to the first group of stages, though, it becomes clear that this is no RPG. There's no leveling, no classes, no quests. There are some 'epic' end-of-stage bosses thrown in, but that's about all. Once your character, Cyrus, morphs into his little magical sphere (I wonder if that's a painful transformation?) he's off to smash bricks, crates, bushes, and various monsters shuffling about, with only his magical paddle to keep him from falling into the undefined abyss that is the bottom of the screen. Once in a while, you can use a key to break into bonus rooms or enter shops to purchase extra lives and other powerups. This is perhaps where Wizorb does deviate from the standard formula, even if only by a small amount. Cyrus can wiggle his magic hands (although I'm not sure how he does this in ball form) to invoke some pretty cool powers. Some are as pure as unleashing a fireball at a block or baddie of your choice, others allow you to control the ball directly in order to get that hard to reach nook or that one last block that just won't die. While you play, potions will fall from certain blocks or crates that allow you to replenish your magic, which is a finite resource that you learn to control quickly, lest you be caught with a stubborn block in a bad place and no spells available to vanquish it. 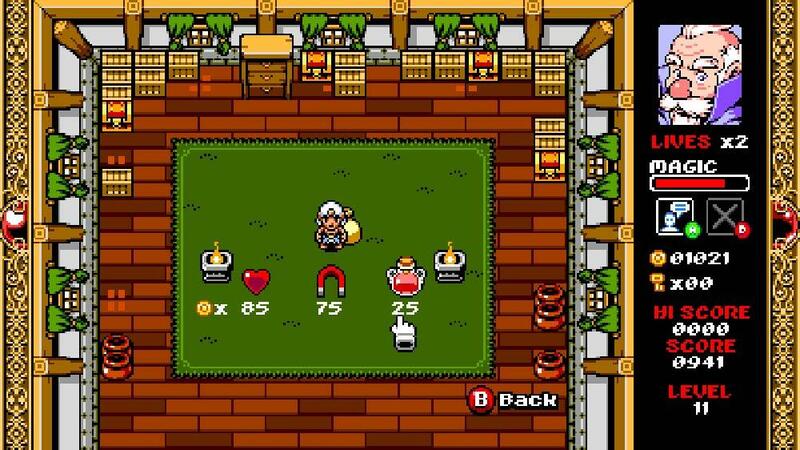 Coins will also fall from the various broken bricks and crates, which allow you to purchase items from the shops as well as help the townspeople repair their village. Bestowing a gift to the villagers brings you a gift in return, such as an extra life or a 'rampart' that acts as a temporary shield to prevent you from losing a life in the event of a few missed balls. That's where the involvement with the town seems to end, though, and I was very disappointed to see the interaction there was severely lacking. Overall, I can't state enough how much I wanted (and still want) to absolutely love Wizorb. It seemed to have it all: to-die-for pixel art, old-school chiptune soundtrack and retro gameplay with a twist. After playing for a while, I was left with the impression that the fact that Wizorb is, in its distilled form, simply a Breakout clone with an RPG flavored retro skin. This will probably be both the best and worst thing about it in the eyes of gamers. For me, I almost dreaded loading up a new level to see whatever configuration of square obstacles lay before me, knowing that I'll have to slowly eliminate them all with only a few spells to save me from the monotony of doing so; the irony being that I most often used those spells to actually avoid playing the game and finish the level more quickly, hopefully to see something more interesting in the next stage. From the perspective of someone who both loves and hates the Arkanoid genre, I can say that Wizorb could have been so much more with some deeper RPG elements. 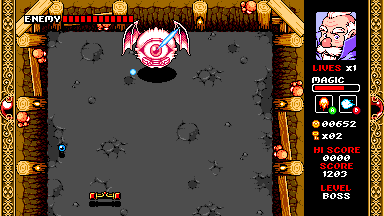 For example, Cyrus could have advanced levels, with higher chains of broken blocks awarding higher portions of experience. He could have had spell upgrade trees, allowing players to select magics that appeal to their play style. The ball could have been faster, the challenges deeper. 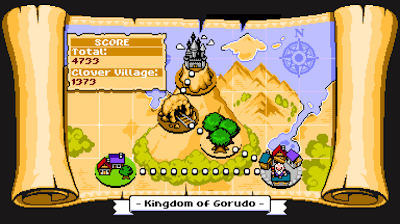 The top-down town and exploration mode could have been expanded dramatically, pulling players into the world of Gorudo. Equippable outfits and gear could have given Cyrus unique abilities or changed the ball's behavior. Coins could be used to purchase unique paddles with different designs. The paddle could have 'gem slots', allowing players to replay stages to collect the rarest gems offering the best upgrades. It could have had a random endless mode. None of those things happen in the game. For me, it's safe to say that while this is an absolutely gorgeous game with tight gameplay, it breaks a lot more bricks than boundaries. Unless you're a die-hard fan of the genre, you may be left wanting more. However, it's worth mentioning that this title offers a lot of gameplay for its low price, currently sitting at about $2.99 USD / £1.99. I don't feel bad about my purchase at all, given that it supports the efforts of the developer and it is such a well made, beautiful game. Buy the XBLA version of the game here (from the XBOX Games Marketplace). Buy the PC/Mac/Linux version of the game here (from the Tribute Games website). I agree. It was fun in the beginning, but then it just got super annoying with all those brick walls that you had to get the ball past, plus the weird tilted angle always confused me a bit.